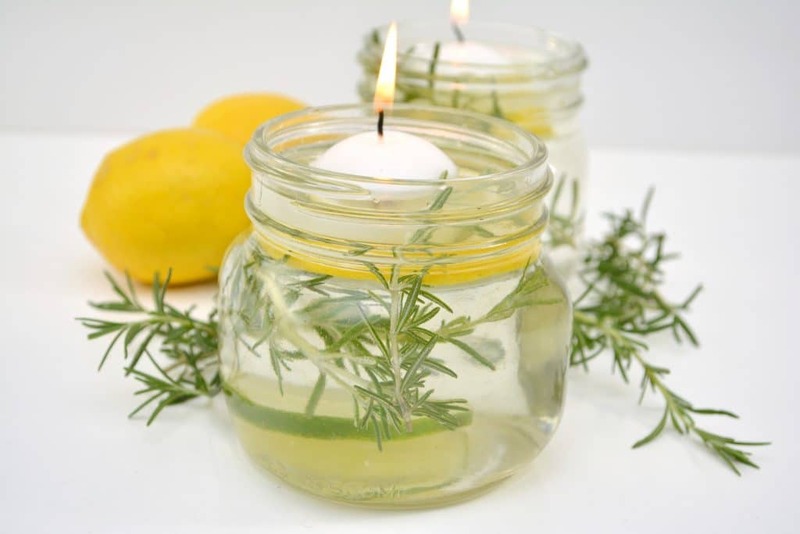 DIY Bug Repellent Mason Jar Luminaries are both gorgeous and extremely effective. Keep those mosquitoes away and spend more time enjoying the outdoors. 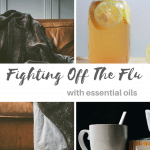 An amazing mix of essential oils to keep those bugs away! Summer is coming and every year it seems that the mosquitoes come sooner and sooner. My son and I are instant targets for the mosquitoes and it can become quite painful at times. My son will, literally, scratch his legs to the point of creating an infection. That was when I knew something had to give. We needed something that would fight off the mosquitoes so that we could go outside and enjoy our lives. I have always been concerned about the dangers of bug repellents and deet. 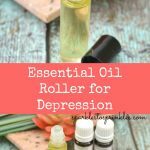 I try to avoid using them if it is possible and found using essential oils will usually keep them at bay. If you do have to use them, please read the information from the EPA on how to use them safely. Being the antique lover that I am, I wanted to use my gorgeous blue vintage mason jars. These were used as centerpieces at my beach wedding so I could not think of a sweeter a reminder to have around the yard. The combination of colors is just gorgeous and the bug repellent is working wonders. Here is another gorgeous version that we made to use in the video. Your options are broad on what type of container you use. Have fun and make it gorgeous! Essential oils are great for all type of things in and around your home. From refreshing and cleansing the air, to soothing a sunburn. One area I found works is a big repellent luminary for outdoor entertaining. The mix of oils helps naturally repel flying mosquitos around the area you are enjoying! There are so many oils that can work in repelling mosquitoes, this mixture is one I use often. Feel free to play around and find a better scent if you would like. It depends on your candles. I keep extra candles on hand so if I see one is getting low, swap it out. The liquid will stay full for quite some time. I do take the time to clean jars and add new water and oil mixture to ensure it stays fresh and potent for bugs lingering in our area. If you can’t find floating candles in your stores, shop online! Amazon sells them and if you plan ahead you could have delivered with next day shipping of free 2-day shipping for Prime members! I have ran into not being able to find them in our area at times. Generally craft stores are the best place to go. Nowadays there are many brands of essential oils that offer quality oils in their products! You can use your favorite brand! Look for a reputable company that sells quality oils. Without quality oils you won’t get as good of results in warding off bugs. Essential oils release fragrance that can naturally repel mosquitos. You will find certain oils like peppermint, citrus, etc. work great in repelling certain types of bugs. If you plan on entertaining this spring and summer, take a few minutes to make a few Luminaries! They are quick, easy and effective ways to naturally repel pesky bugs. 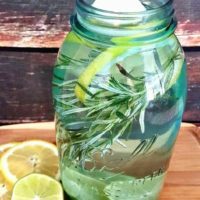 Feel free to swap out rosemary with basil or even peppermint or lavender. Any or all of these will work just as good. The herbs will help repel your bugs and offer a pretty element to your Luminaries! As you can see within minutes you can make these bug repellent Luminaries! Make as many of as little as you want. Just make sure you make enough to cover the area you plan to entertain. Never leave your candles unattended, you don’t want to run the risk of it breaking and starting a fire. Just be aware when using these Luminaries. Have you tried making homemade Luminaries before? 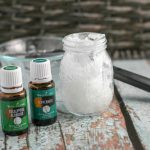 If you love this and would like a more portable version try my DIY Essential Oils Bug Repellent Spray. Slice lemon and limes. Fill jar about 3/4 of the way with water. Start adding 10 drops of each of your essential oils and than stir to mix. Place 2 slices of each, lemon and lime. Fill water to the rim. Place floating candle and light when placed outside. 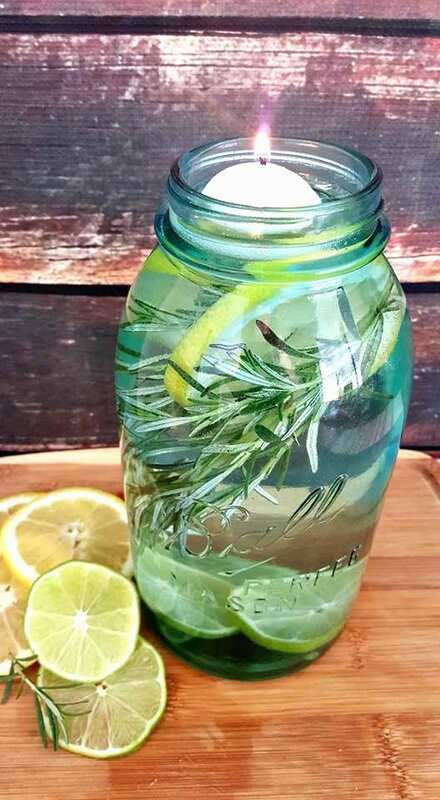 Change water and fruit about twice a week to keep fresh and potent. I’ve read that the mosquitoes are attracted to the sugar in our bodies, and the more sugar one has, the more the attraction. Ok… are we filling the jar with water or the lemon and lime slices 3/4 of the way? Then adding oils and stirring. So sorry.. yes you are filling them 3/4 of the way with water. Add in your oils and then stir well. Then add a couple lemon and a couple of lime slices. How big is the mason jar you used? You can use any size. Just adjust your water accordingly.